Please note that performing missions is only possible if there are opponents in a battle: other players in DM or enemy team players in CTF, TDM and CP. 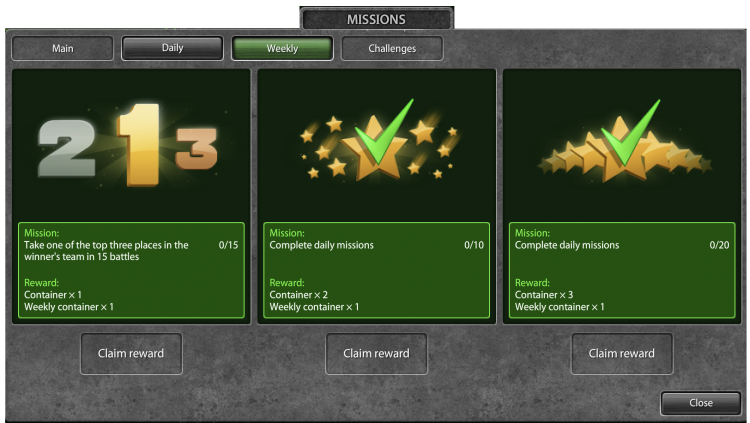 Every day, upon first entering the game, you will be presented with a window containing the 3 missions you should perform to earn your in-game rewards. You can only complete up to 3 missions per day. Any missions that you do not complete on the day, will be re-assigned the next day. A mission is only considered completed after you have clicked the "Claim reward" button. You can check your progress on the "Missions" screen. Your current missions can be exchanged for new ones. You can exchange one mission for free once a day, and for a number of crystals any number of times after that. A mission always gets replaced with a mission of a different type. The price for exchanging a mission is equal to half of the crystal reward you would get for completing it at your current rank. Description: "Earn experience in battles"
Goal: player needs to finish in the top three places on the winning team in any battle mode or map. This includes being top three in a DM battle. Description: "Take one of the top three places in the winner's team"
Description: "Collect First Aid boxes (Any supply possible)"
Description: "Earn crystals in battles"
These 3 special weekly missions must be completed within 7 days of receiving them. Weekly Missions that you did not have time to complete in the allocated time are re-assigned to the next week. If you complete 1 or 2 Weekly Mission but not the other(s), these 1 or 2 that you completed will be replaced with new Weekly Missions in the following week when these missions are re-assigned. Weekly Missions cannot be changed. Challenges are time-limited events similar to "Star Week", with which many tankers are already familiar. Basically, Challenges are events which give you rewards for the number of Stars (a special resource exclusive to these kinds of events) earned in battles. A Challenge consists of many stages (or "tiers"), and each stage brings you additional and better rewards. To complete stages, you need Stars, which are earned exclusively during these kind of “star events” in Matchmaking battles. Read out official wiki page on challenges for more information. This article was helpful for 163 people. Is this article helpful for you?